The event allowed students to network with professionals from a variety of auditing backgrounds, and it showcased the diverse career paths within auditing. The night opened with a reception in which students were welcomed with dinner and the opportunity to mingle with students from other universities. They then participated in a five-minute “speed networking” session with the professionals in attendance. Later, a guest speaker spoke on the importance of etiquette in the auditing profession, and the night ended with students visiting a variety of booths from professionals and firms. This allowed students to network, share their résumés and learn more about the opportunities within the profession. Representatives from 20 companies shared their collective knowledge and experience with the students. 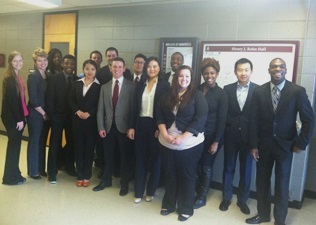 Dr. Marcus Odom, a professor in accounting at SIU, was one of the faculty members to attend the event with the students. Odom explained that SIU always has a large presence at the Internal Auditors Student Night, and that has allowed the university to develop a very good reputation with the St. Louis chapter due to the quality of students who participate. This, in turn, provides SIU students with the opportunity to excel in the professional industry. “We strongly encourage students to participate in these types of events starting their freshman year, because the experience they gain will benefit them in all future meetings with professionals,” Odom said. Johnny Myrick, a graduate student in accounting, was one of those students who felt it was important to attend the event. Myrick was able to improve his networking and leadership skills by attending Student Night. It’s safe to say that the SIU students left their mark on the St. Louis Chapter of Internal Auditors Student Night – and they certainly left an impression on the faculty who attended. “I will put our students up against any other university that attends the event,” Odom said.